Tenochtitlan came to dominate an Alliance of city-states, its ruler became the supreme ruler – the huey tlatoque (‘high king’) – and the city established itself as the capital of the Aztec empire. The Aztec Empire flourished between c. 1345 and 1521 CE and, at its greatest extent, covered most of northern Mesoamerica. Aztec warriors were able to dominate their neighbouring states and permit rulers such as Motecuhzoma II to impose Aztec ideals and religion across Mexico. Highly accomplished in agriculture and trade, the last of the great Mesoamerican civilizations was also noted for its art and architecture which ranks amongst the finest ever produced on the continent. Sometime around 1100 CE the city-states or altepetl which were spread over central Mexico began to compete with each other for local resources and regional dominance. Each state had its own ruler or tlatoani who led a council of nobles but these small urban centres surrounded by farmland soon sought to expand their wealth and influence so that by c. 1400 CE several small empires had formed in the Valley of Mexico. 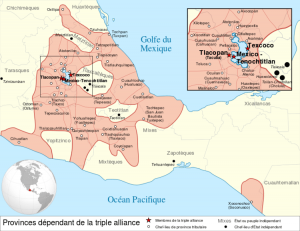 Dominant amongst these were Texcoco, capital of the Acholhua region, and Azcapotzalco, capital of the Tepenec. These two empires came face to face in 1428 CE with the Tepanec War. The Azcapotzalco forces were defeated by an alliance of Texcoco, Tenochtitlan (the capital of the Mexica) and several other smaller cities. 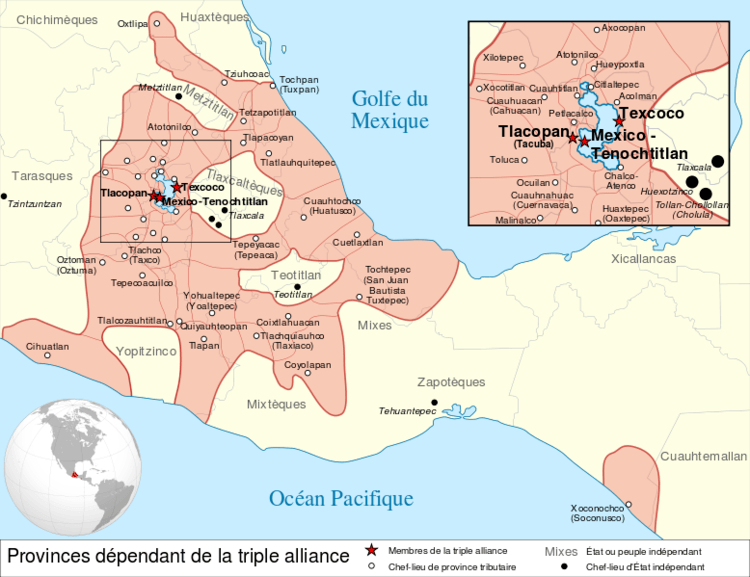 Following victory a Triple Alliance was formed between Texcoco, Tenochtitlan and a rebel Tepanec city, Tlacopan. A campaign of territorial expansion began where the spoils of war – usually in the form of tributes from the conquered – were shared between these three great cities. Over time Tenochtitlan came to dominate the Alliance, its ruler became the supreme ruer – the huey tlatoque (‘high king’) – and the city established itself as the capital of the Aztec empire. The empire continued to expand from 1430 CE and the Aztec military – bolstered by conscription of all adult males, men supplied from allied and conquered states, and such elite groups as the Eagle and Jaguar warriors – swept aside their rivals. Aztec warriors wore padded cotton armour, carried a wooden or reed shield covered in hide, and wielded weapons such as a super sharp obsidian sword-club (macuahuitl), a spear or dart thrower (atlatl), and bow and arrows. Elite warriors also wore spectacular feathered and animal skin costumes and headdresses to signify their rank. Battles were concentrated in or around major cities and when these fell the victors claimed the whole surrounding territory. Regular tributes were extracted and captives were taken back to Tenochtitlan for ritual sacrifice. In this way the Aztec empire came to cover most of northern Mexico, an area of some 135,000 square kilometres. The empire was kept together through the appointment of officials from the Aztec heartland, inter-marriages, gift-giving, invitations to important ceremonies, the building of monuments and artworks which promoted Aztec imperial ideology, and most importantly of all, the ever-present threat of military intervention. Some states were integrated more than others whilst those on the extremities of the empire became useful buffer zones against more hostile neighbours, notably the Tarascan civilization. The Aztec capital of Tenochtitlan on the western shore of Lake Texcoco flourished so that the city could boast at least 200,000 inhabitants by the early 16th century CE, making it the largest city in the Pre-Columbian Americas. These inhabitants were divided into several social strata. At the top were local rulers (teteuhctin), then came nobles (pipiltin), commoners (macehualtin), serfs (mayeque), and finally slaves (tlacohtin). The strata seem to have been relatively fixed but there is some evidence of movement between them, especially in the lower classes. 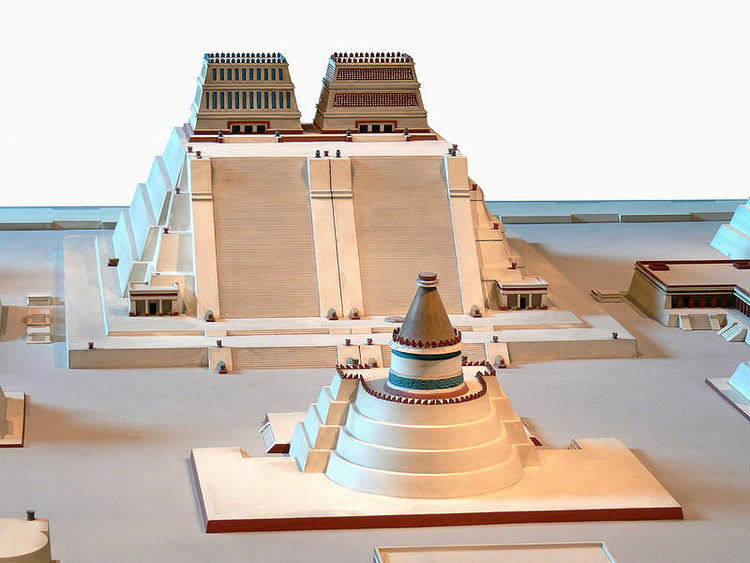 Not only the political and religious capital, Tenochtitlán was also a huge trading centre with goods flowing in and out such as gold, greenstone, turquoise, cotton, cacao beans, tobacco, pottery, tools, weapons, foodstuffs (tortillas, chile sauces, maize, beans, and even insects, for example) and slaves. The Spanish invaders were hugely impressed by the city’s splendour and magnificent architecture and artwork, especially the Templo Mayor pyramid and massive stone sculptures. Dominating the city was the huge Sacred Precinct with its temples and monumental ball court. Tenochtitlan’s water management was also impressive with large canals criss-crossing the city which was itself surrounded by chinampas – raised and flooded fields – which greatly increased the agricultural capacity of the Aztecs. There were also anti-flood dykes, artificial reservoirs for fresh water, and wonderful flower gardens dotted around the city. Mythology and religion, as with most ancient cultures, were closely intertwined for the Aztecs. The very founding of Tenochtitlán was based on the belief that peoples from the mythical land of plenty Aztlán (literally ‘Land of White Herons’ and origin of the Aztec name) in the far northwest had first settled in the Valley of Mexico. They had been shown the way by their god Huitzilopochtli who had sent an eagle sitting on a cactus to indicate exactly where these migrants should build their new home. The god also gave these people their name, the Mexica, who along with other ethnic groups, who similarly spoke Nahuatl, collectively made up the peoples now generally known as the Aztecs. The Aztec pantheon included a mix of older Mesoamerian gods and specifically Mexica deities. The two principal gods worshipped were Huitzilopochtli (the war and sun god) and Tlaloc (the rain god) and both had a temple on top of the Templo Mayor pyramid at the heart of Tenochtitlan. Other important gods were Quetzalcoatl (the feathered serpent god common to many Mesoamerican cultures), Tezcatlipoca (supreme god at Texcoco), Xipe Totec (god of Spring and agriculture), Xiuhtecuhtli (god of fire), Xochipilli (god of summertime and flowers), Ometeotl (the creator god), Mictlantecuhtli (god of the dead) and Coatlicue (the earth-mother goddess). This sometimes bewildering array of gods presided over every aspect of the human condition. The timing of ceremonies in honour of these deities was dictated by a variety of calendars. There was the 260-day Aztec calendar which was divided into 20 weeks, each of 13 days which carried names such as Crocodile and Wind. There was also a Solar calendar consisting of 18 months, each of 20 days. The 584 day period covering the rise of Venus was also important and there was a 52 year cycle of the sun to be considered. The movement of planets and stars were carefully observed (albeit not as accurately, though, as the Maya had done) and they provided the motive for the specific timing of many religious rites and agricultural practices. 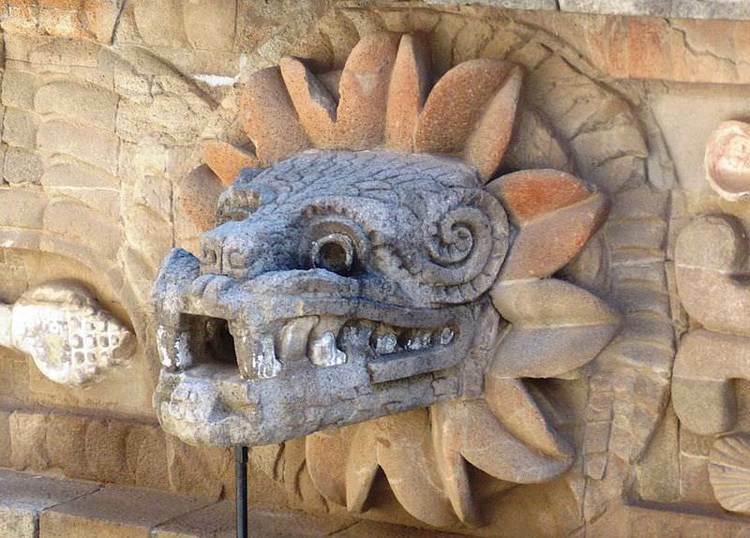 The sun, not surprisingly, had great significance for the Aztecs. They believed that the world went through a series of cosmic ages, each had its own sun but finally each world was destroyed and replaced by another until the fifth and final age was reached – the present day for the Aztecs. This cosmic progression was wonderfully represented in the famous Sun Stone but also crops up in many other places too. The gods were honoured with festivals, banquets, music, dancing, decoration of statues, burning of incense, the ritual burial of precious goods, penances such as blood-letting, and animal sacrifices. Humans, both adults and less often children, were also frequently sacrificed to metaphorically ‘feed’ the gods and keep them happy lest they become angry and make life difficult for humans by sending storms, droughts etc. or even just to keep the sun appearing every day. Victims were usually taken from the losing side in wars. Indeed, the so-called ‘Flowery Wars’ were specifically undertaken to collect sacrificial victims. The most prestigious offerings were those warriors who had shown great bravery in battle. The sacrifice itself could take three main forms: the heart was removed, the victim was decapitated, or the victim was made to fight in a hopelessly one-sided contest against elite warriors. There were also impersonators who dressed in the regalia of a specific god and at the climax of the ceremony were themselves sacrificed. Organised in guilds and attached to the main palaces, artisans could specialise in metalwork, wood carving or stone sculpture, with materials used such as amethyst, rock crystal, gold, silver, and exotic feathers. Perhaps some of the most striking art objects are those which employed turquoise mosaic such as the famous mask of Xuihtecuhtli. Common forms of pottery vessels include anthropomorphic vases in bright colours and of special note was the finely made and highly prized Cholula ware from Cholollan. Aztec art depicted all manner of subjects but especially popular were animals, plants and gods, particularly those related to fertility and agriculture. Art could also be used as propaganda to spread the imperial dominance of Tenochtitlan. 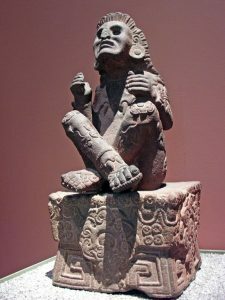 Examples such as the Sun Stone, Stone of Tizoc, and Throne of Motecuhzoma II all portray Aztec ideology and seek to closely correlate political rulers to cosmic events and even the gods themselves. 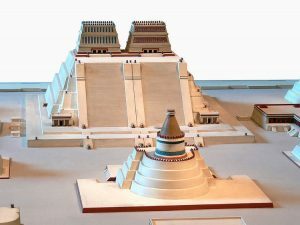 Even architecture could achieve this aim, for example, the Templo Mayor pyramid sought to replicate the sacred snake mountain of Aztec mythology, Coatepec, and temples and statues bearing Aztec symbols were set up across the empire. The Aztec empire, which controlled some 11,000,000 people, had always had to deal with minor rebellions – typically, when new rulers took power at Tenochtitlan – but these had always been swiftly crushed. The tide began to turn, though, when the Aztecs were heavily defeated by the Tlaxcala and Huexotzingo in 1515 CE. With the arrival of the Spanish, some of these rebel states would again seize the opportunity to gain their independence. When the conquistadors finally did arrive from the Old World sailing their floating palaces and led by Hernán Cortés, their initial relations with the leader of the Aztecs, Motecuhzoma II, were friendly and valuable gifts were exchanged. Things turned sour, though, when a small group of Spanish soldiers were killed at Tenochtitlan while Cortés was away at Veracruz. The Aztec warriors, unhappy at Motecuhzoma’s passivity, overthrew him and set Cuitlahuac as the new tlatoani. This incident was just what Cortés needed and he returned to the city to relieve the besieged remaining Spanish but was forced to withdraw on the 30th of June 1520 CE in what became known as the Noche Triste. Gathering local allies Cortés returned ten months later and in 1521 CE he laid siege to the city. Lacking food and ravaged by disease, the Aztecs, now led by Cuauhtemoc, finally collapsed on the fateful day of 13th of August 1521 CE. Tenochtitlan was sacked and its monuments destroyed. From the ashes rose the new capital of the colony of New Spain and the long line of Mesoamerican civilizations which had stretched right back to the Olmec came to a dramatic and brutal end. This entry was posted in Aztec, History, Mesoamerica. Bookmark the permalink.